The Karbonn A18 Smart Dual-SIM smartphone features 4.3-inch IPS display and is powered by 1GHz processor. Karbonn A18 Smart sports 5MP rear camera and 1.3MP front-facing web camera. Connectivity options of Karbonn A18 Smart includes 3G, 2G, Wi-Fi, Wi-Fi hotspot and USB tethering. It comes with a standard 1,500mAh battery. 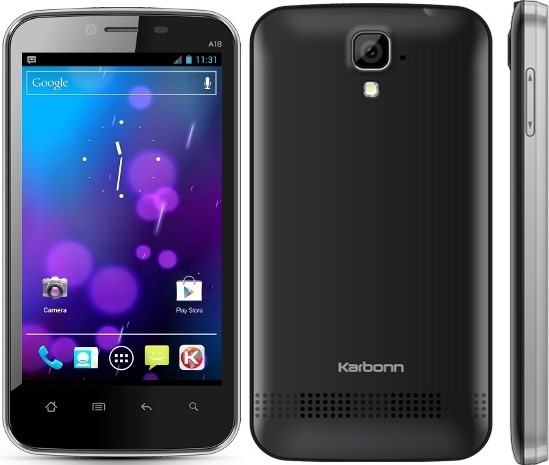 Karbonn A18 Smart has a price tag of Rs 12,990 INR. Tags:Karbonn A18 Smart, Karbonn A18 Smart features, Karbonn A18 Smart specifications, Karbonn A18 Smart review, Karbonn A18 Smart details, Karbonn A18 Smart availability, Karbonn A18 Smart specs, Karbonn A18 Smart images, Karbonn A18 Smart pics, Karbonn A18 Smart pictures, Karbonn A18 Smart price.